Every once in a while, I record a screencast and I post it on this blog. You can find links here to a series of screencasts I did on Visual Studio Coded UI Tests. It has been a long time since I did so because screencasts tend to be a lot of work when done correctly. But now I’m motivated to start doing these regularly. I plan to keep them short – anywhere from 5-30 minutes and to keep each video focused on a single topic. My goal is to release a new video every Friday – in the same way that I release a new Technology and Friends episode every Monday. As in the past, I’m branding these as “G-Cast” – an abbreviation of Giard’s Screencasts and I’m rebooting the franchise to start at Episode 1. I even have a fun intro sequence that will appear at the beginning of each video. The first G-Cast will debut tomorrow and will be part of a series showing how to use Azure Mobile Services. Stay tuned and let me know what you think of this project. Technology and Friends began in Sandusky, OH in January 2009. I brought my video camera to Codemash and walked into the speaker room asking people if they wanted to talk on-camera about their favourite technology. I had an idea that I wanted to publish these interviews on-line but I did not know what form that would take. Eventually, this idea evolved into Technology and Friends and I've been regularly publishing this show for over 6 and a half years. It's rare that a Monday passes without the release of a new episode. 375 episodes later, we are moving. From technologyandfriends.com to Channel 9. This has been the single biggest request I've received. And it’s built into Channel 9. Users can download each episode in the resolution of their choosing. Channel 9 encodes all videos in High, Medium, and Low Quality. If bandwidth or disc space is tight, you can choose the lower quality. For better viewing, choose the high quality. For lower bandwidth or limited disc space, choose the smaller files. This was another common request from fans of the show. It's now possible to grab just the audio to listen while you're driving, exercising or working around the house. I've been paying for this show out of my own pocket and the online fees alone come to almost a thousand dollars a year. Channel 9 reaches a very broad audience and this show will be indexed along with their other content, making it easier to find for a number of people. So far, I have migrated the last 6 months of shows. In the coming weeks, I plan to move more of the older shows to the new site. I hope you enjoy the experience. Let me know your thoughts. I move around quite a bit and my laptop connects to Wi-Fi networks all over the world. Sometimes I return to those places and re-connect to the same network weeks or months later. Once in a while, this causes a problem when a Wi-Fi network security credentials change and laptop's saved Wi-Fi settings continue to use the credentials I entered last time, without allowing me to enter the new credentials. The simplest solution to this problem is to remove the Wi-Fi network from my laptop's list of saved networks Wi-Fi networks; then, re-add it. If it's not a hidden network, it should automatically appear when you are in range, even if it is not "saved". But the option to remove a saved Wi-Fi network changes with each version of Windows and it may even be missing in some versions (I still can't find it in the Windows 10 preview I'm currently running). However, you can use the command line to accomplish this. Here are the steps. Open a command prompt as an Administrator. This is an option when you right-click the command prompt shortcut. It requires confirmation because you can wreak a lot of havoc as an administrator. 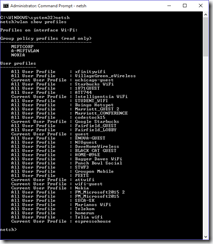 At the netsh prompt, type "wlan show profiles" and press ENTER to display a list of all saved Wi-Fi networks, as shown in Figure 2. Find the network you want to remove; then type "wlan delete profile name=<network name>", where network name is the network as listed in the last command. This must be surrounded by quotes. Spelling is important but capitalization is not. Press ENTER to remove this network, as shown in Figure 3. That's it. You can close the command prompt or type "exit" and press ENTER to leave Network Shell Mode. I recommend not leaving and Administrator-level command prompt open in case you forget the power you have. This method appears to work for Windows 7, 8, 8.1, and 10. Don’t get caught unable to connect to a wi-fi network again. Last night, I was the guest on the Azure podcast. The show is hosted by Cale Teeter, Evan Basalik and Sujit D'Mello and they have been recording since October 2013 – coincidentally, the same week that I joined Microsoft. We talked about a number of topics, including education, startups, and Azure’s support for open source software. It was my first time on this podcast and I really enjoyed it. You can listen the show by clicking this link. Two hours after Codestock ended, I sat at a local restaurant enjoying dinner with Tennessee friends. I was tired and mostly listened to the conversation around the table. I decided only recently to attend Codestock this year - primarily to help manage Microsoft's sponsorship of the event - but I ended up participating in 4 different presentations. Scott Hanselman delivered the keynote address at the beginning of Day 1 and we were allowed to introduce him to the audience and speak for about 15 minutes. Jennifer Marsman and I decided to highlight a golf scoring application created by Knoxville developer Wally McClure. We chose this app because it used many features of Azure and ran on multiple devices, including an iPad. Rather than simply talking about the app, we wrote a short skit in which Jennifer and I bragged about how much we knew about golf and Wally patiently explained how much more complicated golf scoring was than we understood. Performing a skit is a different way of delivering a message like this, but based on the feedback I received afterward, most people seemed to enjoy it. On Day 1, I was asked to sit on a "Mobile Strategy Panel" because one of the panelists cancelled at the last minute. Sam Basu of Telerik asked each panelist questions about the state of various mobile platforms and took questions from the audience. The session was recorded by Ed Charbeneau (one of the panelists) for his podcast, so this recording should be publicly available soon. I also signed up to deliver a 20-minute Lightning Talk titled "Microsoft Azure Without Microsoft" in which I described many of the open source technologies and alternate platforms that are supported on Microsoft Azure. On day 2, I delivered a presentation: "I Did Not Know Microsoft Did That". This presentation was created and submitted by my colleague Bill Fink, but Bill fell ill and could not make it. The organizers liked Bill's topic and asked if I could deliver it. I used Bill's slides to talk about free programs offered by Microsoft, such as BizSpark, Dreamspark, and Microsoft Virtual Academy. Everyone in the audience I spoke with told me they were unaware of more than 2 of the dozen or so programs I covered and wanted to explore at least one of them more. The local Microsoft store was on-site with several tables full of PCs, laptops, tablets, phones, and even a 3D printer. This was an idea I pitched to Codestock last year and it was so well-received that the organizers contacted the store themselves this year. I had a chance to attend a few sessions as well. Jennifer Marsman gave an excellent demonstration in which she used a device to measure EEG brain patterns and fed data into Azure Machine Learning to determine how the brain reacts when lying versus telling the truth; David Neal gave a very good overview of node.js for .NET developers; and Jeff Fritz showed off the features coming in ASP.NET 5. I love attending Codestock because it gives me a chance to connect with people in a different part of the country than I normally interact with. I spoke with people about F# and video production and web development and cloud computing. I even captured a few video interviews, which I've already started sharing online. Attendance nearly doubled this year over last year with nearly 900 developers making the trek. The organizers moved it to a much larger venue and may grow it even more in the future. I think you can tell now why I was so tired following the conference. Luckily, I’m home now and I’ve already started to re-energize. For next year.